Scroll down this page to take a look at screenshots of various features of SpeechWire Tournament Services. SpeechWire's home page is laid out intuitively, with easy-to-read buttons and descriptions, so you can quickly find the page that you are looking for at any given time. Monitor the progress of online registration for your tournament, or enter teams' entry numbers yourself, using the registration manager. 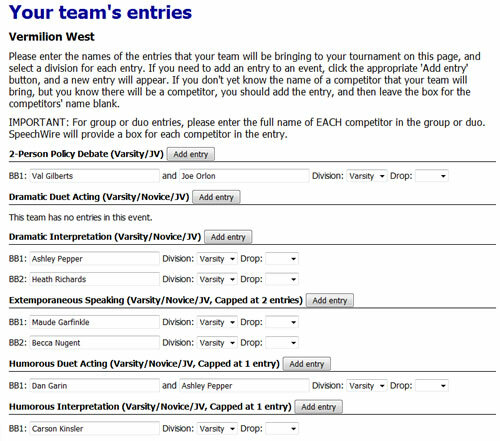 You can set caps on entries for teams or events. 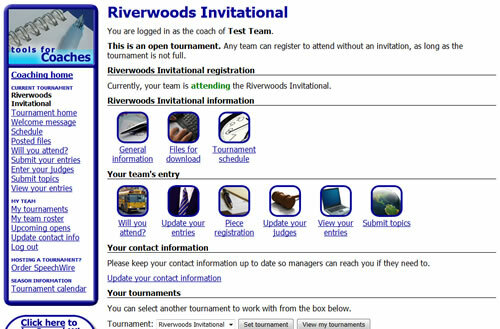 Teams can log in to your tournament at www.SpeechWire.com once you have invited them and use the newly redesigned, intuitively laid out registration mini-site to let you know if they are coming and tell you how many students and judges they are bringing. SpeechWire remembers which students are members of each team, and can auto-complete their names during registration to speed things up. 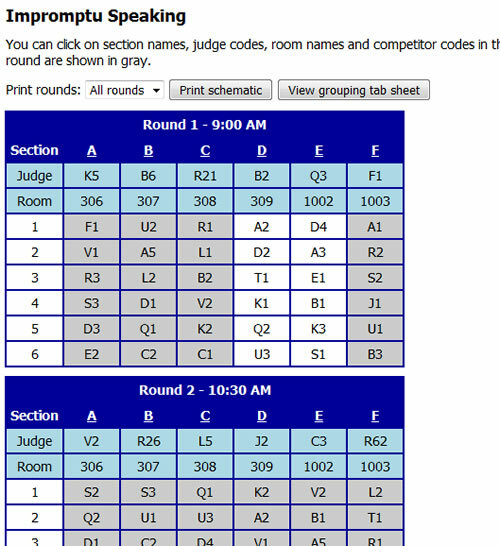 SpeechWire can also collect topics for prep events, and judge and piece names if you need them. Room assignments are easy with SpeechWire's intuitive room management interface. Once you have approved the number of entries and judges on each team, as well as the number of rounds and sections for each event, SpeechWire can usually build your tournament's schematic in about one minute. You can build all of your events' schedules at once, or build them a little at a time, before or during the tournament. You can view your event schematics on the tournament website, as well as printing them out for distribution at your tournament. 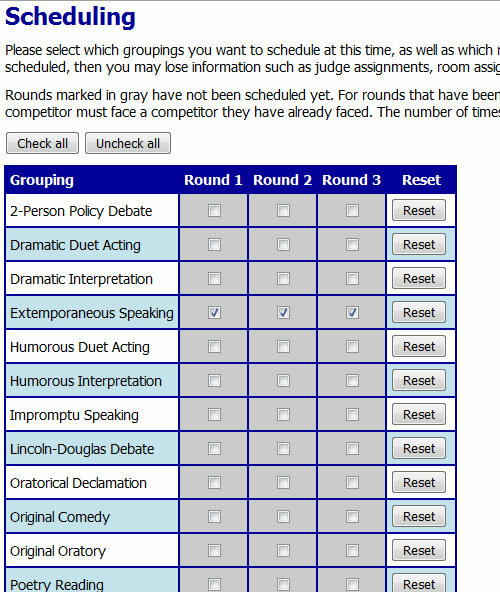 SpeechWire grays out students in each round as it receives ranks for them in speech, or as it receives decisions for debates. 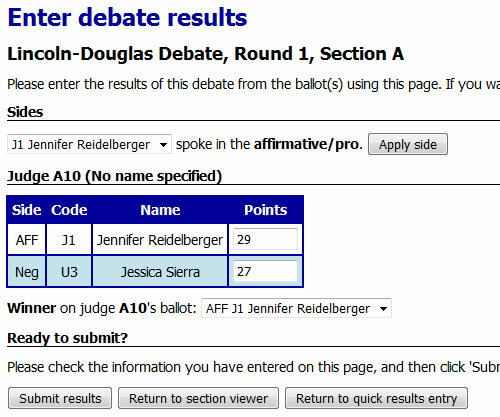 When ballots are returned by judges after rounds, you can enter each ballot one at a time - SpeechWire will list the codes and names of the entries in the section, and you just enter the ranks (and rating points, if applicable) for speech, and the decisions and rating points (if applicable) for debate. 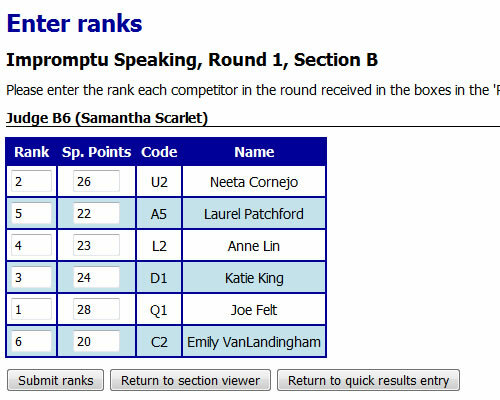 If your tournament will have final rounds, SpeechWire lists all the possible places where you can make the cut to finals, as well as how many entries will make the final round at each cut point. 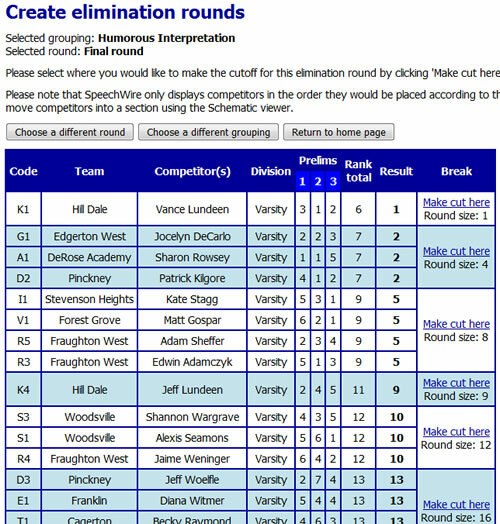 SpeechWire can incorporate a wide variety of tiebreakers when creating final rounds. 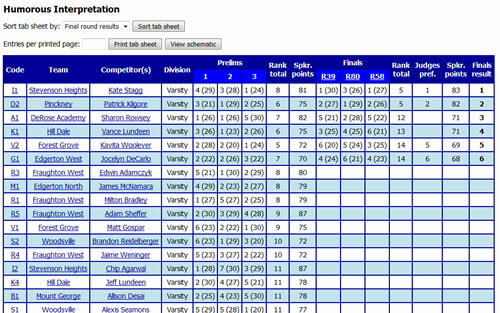 Tab sheets are updated live throughout the tournament, so that tab room staff can monitor the results. 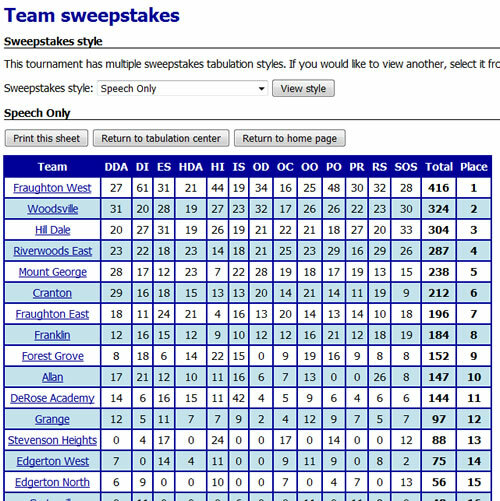 The team sweepstakes can be tabulated based on preliminary or final round scores. Like most reports from SpeechWire, it comes with a printer-friendly version, also. 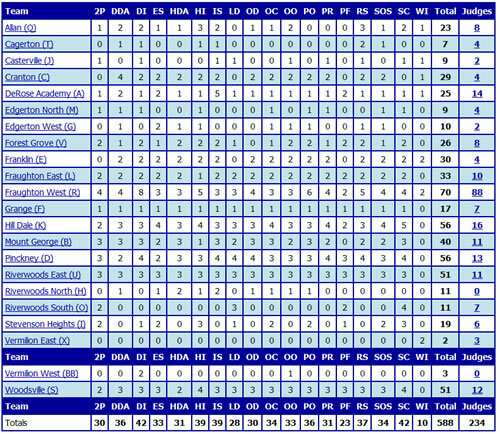 You can view a selection of some sample documents generated by SpeechWire Tournament Services by clicking on the links below. If you want to order SpeechWire for your tournament, please visit the Order page, or email support@speechwire.com for more information.